Last week I asked: How do you make fish satays? Travel is and should be a learning experience. 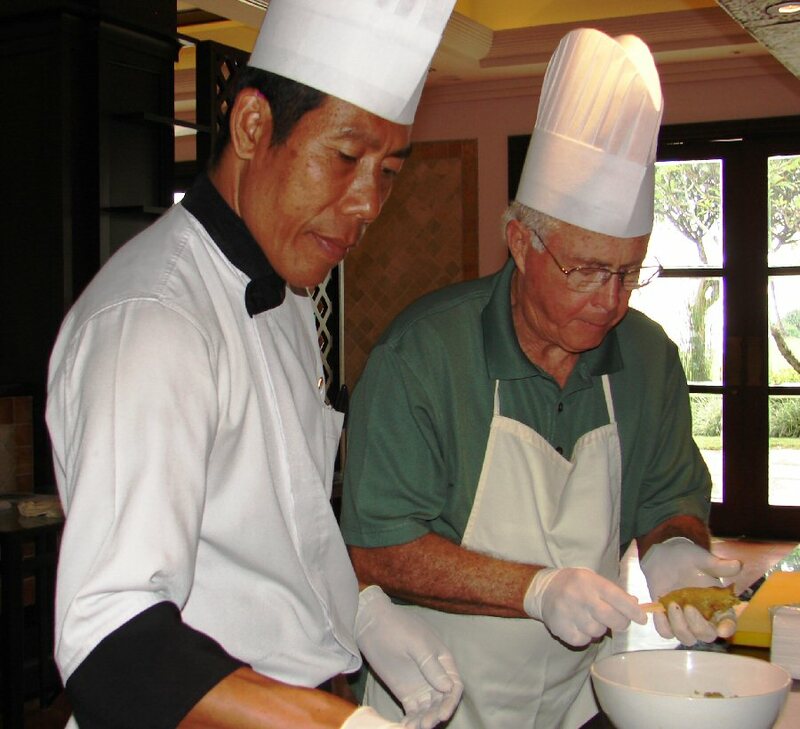 Cooking classes or experiences are a fun and delectable way to learn about a local culture. When John and I were at the Pan Pacific Niwana in Bali, Indonesia, we participated in a cooking class. Hotels often make such classes available to their guests. We have found that people are happy to share their culture and during a cooking experience we often learn more about a local culture the goes beyond the culinary aspects. 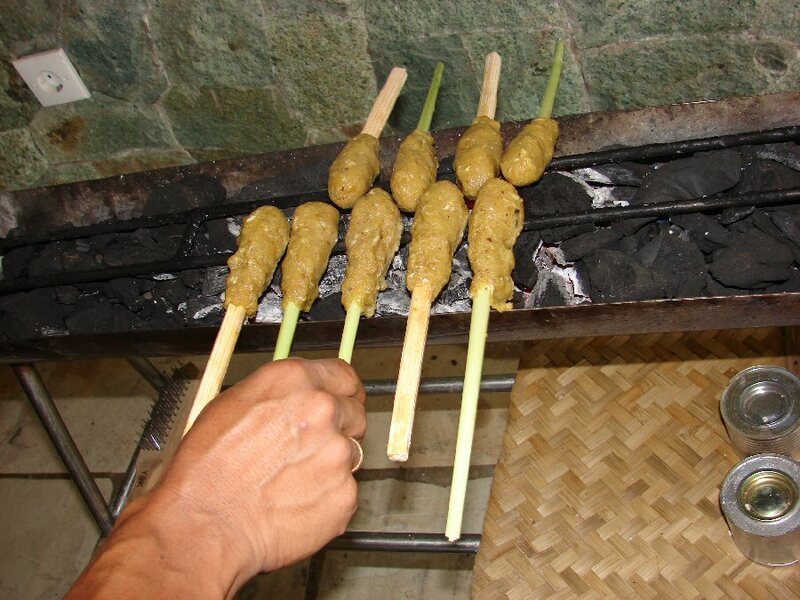 Chef M. Kadek Ari Utami taught us to make several Balinese dishes including fish satay. We knew that she was her parent’s second child because Balinese traditionally include the word for the child’s birth order in their child’s name. Kadek means ‘second born,’ Wayan indicated ‘first born,’ while Nyoman is reserved for the ‘third born’ and the ‘fourth born’ is Ketut. A fifth child may be called Wayan Balik which means Wayan again. And so it goes. We are usually in Asia for Earth Hour when, in 2013, more than 7,000 places in 153 countries and territories turned off their lights for an hour in an effort to bring attention to energy conservation and the need to protect the environment. I think the Balinese go one step better and have been doing so for years but their energy saving is just an extra benefit in the way they celebrate a religious holiday. 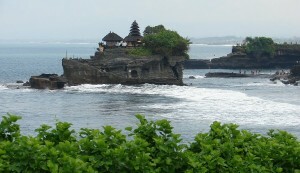 I would love to be in Bali on Nyepi Day, the Balinese day of silence. It is the beginning of the new year according to the Hindu calendar and usually occurs in March. It is 24 hours of reflection without the noise of vehicles, TVs, and even the airport is closed to traffic. While most of the people in Indonesia are Moslem the majority of the people in Bali are Hindu but even the non-Hindu people of Bali observe Nyepi Day out of respect. Imagine 24 hours without the sound of cars, radios, TVs or any other manmade noise. 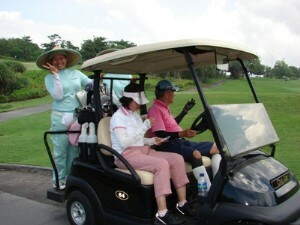 On Nyepit Day guests at the Pan Pacific Nirwana can swim in the multi-level pool, enjoy a spa treatment, play golf on the Greg Norman course, and walk to the Tamah Lot Temple. I think a day of silence would benefit people and the environment. After our cooking lesson we took the short walk across the golf course to Tamah Lot Temple, located on a rocky outcropping just off shore. It is an important pilgrimage site for Hindus. Blend the shallots, garlic, fresh ginger, turmeric, lemon grass, galangal, red chili, bird’s eye chili and bay leaves to make bumbu lengkap, a Balinese seasoning paste. Mix together with fish, fried shallots, lemon leaves, palm sugar and shrimp paste. Add coconut a little at time to make a mixture that will hold together on the skewer. Shape mixture on skewers and grill until light brown and thoroughly cooked. Travel Trivia Tease™: What iconic CNY boat is 60 this year? Look for the answer next week. I enjoyed your story. I have sooo many pins on my map and this is one of them.